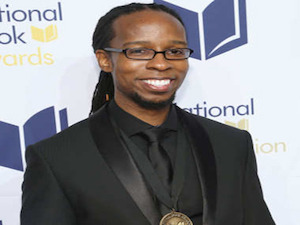 Dr. Ibram X. Kendi hopes that the 2016 National Book Award for nonfiction he was awarded for Stamped from the Beginning: The Definitive History of Racist Ideas in America, could bring more attention to other scholars taking a hard look at the history of racism in America. In Stamped from the Beginning, Kendi uses the vantage points of five individuals from past and present with divergent views on matters of race — Cotton Mather, Thomas Jefferson, William Lloyd Garrison, W.E.B. Du Bois, and Angela Davis — to trace the history of the development of racist ideas, noting that besides those who are segregationist and antiracist, there is a third category of individuals — assimilationists — whose melding of the racists ideas of segregationists and antiracist ideas have ended up sustaining ignorance and hate. The other finalists for the 2016 National Book Award for nonfiction included Dr. Arlie Russell Hochschild for Strangers in Their Own Land: Anger and Mourning on the American Right; Dr. Viet Thanh Nguyen for Nothing Ever Dies: Vietnam and the Memory of War; Dr. Andrés Reséndez for The Other Slavery: The Uncovered Story of Indian Enslavement in America; and Dr. Heather Ann Thompson for Blood in the Water: The Attica Prison Uprising of 1971 and Its Legacy. Interestingly enough, the awards ceremony was on November 16, just over a week after Donald Trump surprised many by defeating Hillary Clinton in the U.S. presidential election. In her announcement of the award for Stamped from the Beginning, Masha Gessen, chair of the judges’ panel for the 2016 National Book Awards for nonfiction, noted that the list of finalists had, over that past week, “begun to feel ever more timely and ever more urgent. According to Kendi, “A certain segment of Americans are … searching and trying to understand how a Donald Trump could follow Barack Obama. How a Donald Trump could run on a platform of racist ideas and win. “And I think one of the ways in which Stamped from the Beginning sort of provides insight into how that can happen is because I actually chronicle a two-part history of race. One part chronicling the history of racial progress. And the other part chronicling the progression of racism. “And Barack Obama represents racial progress and Donald Trump represents the progression of racism. And typically, the progression of racism has followed racial progress. When Black people have broken through barriers, new barriers have been put in place to hold them back,” Kendi adds. In his book, Kendi postulates that it is commonly thought that ignorance and hate are behind racist ideas, and the people who harbor racist ideas are the ones who have created racist policies. Thus, solutions have been crafted to educate people away from racist ideas. Kendi adds that these racist ideas postulated that Black people and their inferiorities were to blame for racial disparities. Thus, those who created racist ideas largely out of self-interest were “off the hook” and “then the circulation of racist ideas led to ignorance and hate.